The ability to cover the screen and still cue the film properly. You only want the sound! Access to this site or a download of the clip. Speakers for playing the soundtrack to the class. And of course access to a screen for playing the final version with picture. Choose one of the film clips on this site. If your group is older then The Sandman works well. 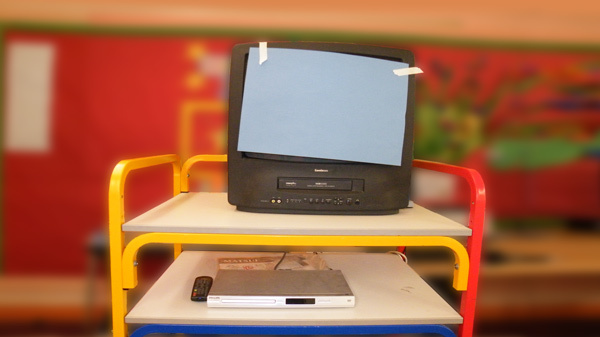 Listen to the film's soundtrack with the class, covering the screen; but additionally ask them to close their eyes, to reduce visual distractions. Discuss with the class what they know, think or feel about the film - and most importantly, how and why did they get this impression? What kind of film is it? Is it live action or animation? What genre is it? What is the mood of the film? How does it make you feel? Who do they imagine the main character to be? And what other kinds of characters come into the story? Where do they think the story takes place? What sorts of things happen in the story? Are there moments of tension, humour, relief, excitement, sadness...? When do these things occur in the story? Play the soundtrack again, and stop it at particular points. Ask the class to describe in writing what the sound is like at that point. For example, 'the music builds to a crescendo' or 'there was a tinkling, tingling sound'. And what was the effect on them? 'My muscles tightened in expectation' or 'a cold shiver of fear trickled down my spine'. How does it live up to the imaginations and expectations of the class? And are there bits where they all got it spot on? Look more closely at the bits where each of these occur and see if the class can identify why they thought what they thought. Where they got it wrong, why? Did the soundtrack only provide some of the information they needed?